Following the conclusion of week three, SuiteSports is ready to unveil is updated MIAA Football Top 25 Poll as selected by its panel of writers, correspondents, and editors. There is minimal movement inside our top 10 this week, with Needham making the one big jump four spots up to No. 10. Elsewhere, Braintree moves into the top 15 with its win over Framingham and Tewksbury and Stoneham supplant themselves in the top 20. Three new teams headline our final five in the poll, with Natick returning at No. 21, while Marlboro and Acton-Boxboro appear for the first time. 1. Everett (3-0; Last Week: 1) Crimson Tide had their first scare of the season courtesy of St. John's Prep, but held on late behind some stellar secondary play. 2. Lincoln-Sudbury (3-0; Last Week: 2) The Lincoln-Sudbury machine keeps on rolling, with no sign of it slowing down anytime soon. 3. Catholic Memorial (3-0; Last Week: 3) Catholic Memorial's defense continues to fire on all cylinders, with a chance to really make an impression this week against Xaverian. 4. 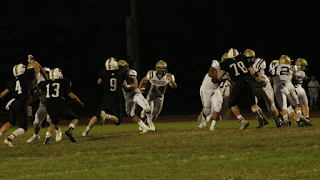 Xaverian (2-1; Last Week: 4) The win over Archbishop Stepniac (NY) won't only show up in the playoff seedings, but it proves the Hawks are as dangerous as any team in Div. 1. 5. North Andover (3-0; Last Week: 5) It may not have been pretty, but the Scarlet Knights proved they can win in more ways than one when they trudged past Central Catholic in a rock fight. 6. St. John's Prep (2-1; Last Week: 6) No shame in the Eagles going into Everett and playing the Crimson Tide pound-for-pound for 44 minutes. 7. Mansfield (2-1; Last Week: 7) Quality bounce back week for Mansfield as they knocked off league rival Franklin. The pressure on Vinnie Holmes and the Hornets' ground game just got that much bigger. 8. Doherty (3-0; Last Week: 9) Through three weeks, the Highlanders continue to look like the favorite in Div. 3 Central. 9. Mashpee (3-0; Last Week: 8) All Mashpee does is win, win, win. Another shutout victory over Coyle and Cassidy extends the winning streak to 23. 10. Needham (3-0; Last Week: 14) Rockets went into Newton North and made a statement with a 38-7 victory over the previously unbeaten Tigers. Tyler Reid is developing into quite the option on offense. 11. Shrewsbury (3-0; Last Week: 11) Colonials offense showed that week two was a mere blip on the schedule as they recovered for a huge night versus Groton-Dunstable. 12. Duxbury (3-0; Last Week: 10) The Dragons struggled against Plymouth North before ultimately escaping with a 12-6 win. Two huge weeks loom versus Whitman-Hanson and Hingham. 13. King Philip (2-1; Last Week: 13) Strong defensive play and a ground-and-pound scheme on offense continues to get it done for King Philip. Now the Warriors will try to make it six straight wins over Mansfield when the two meet on Friday. 14. Braintree (3-0; Last Week: 17) Braintree continued its big start to the season with a win over Framingham. The schedule starts to get increasingly more difficult beginning on Friday versus Natick. 15. Brockton (2-0; Last Week: 15) It was a bye-week for the Boxers and it could not come at a better time with BC High and Xaverian both coming up on the schedule. 16. Hingham (2-0; Last Week: 19) The Harbormen certainly proved they can play with anyone in Div. 3 South with a 25-13 win over Whitman-Hanson. Losing Jack Johnson will hurt, but Spencer Cassell and Cole Finney are two premiere weapons for any quarterback to work with. 17. North Attleboro (2-1; Last Week: 12) Red Rocketeers made sure to quickly forget their week two loss to Bishop Feehan, winning big over Sharon. 18. Tewksbury (3-0; Last Week: 20) Redmen defense was nothing short of exemplary in a road shutout of BC High. They allowed just three first downs and 62 total yards for the game. 19. Springfield Central (2-1; Last Week: 16) If there was any doubt remaining about the top team in Springfield, the Golden Eagles ended it with a 55-0 drubbing of West Springfield. 20. Stoneham (3-0; Last Week: 23) Christos Argyropolous cooled off red-hot Burlington, rushing for 220 yards and four touchdowns to keep the defending Div. 6 North champion Spartans unbeaten. 21. Natick (1-2; Last Week: NR) The Redhaws let their frustration from two tough early season losses out on Friday, with Will Lederman doing the damage against Walpole. 22. Marlboro (3-0; Last Week: NR) Marlboro makes its 2018 season debut following a big win over Westborough. A huge matchup with also undefeated Nashoba is set for Friday. 23. Acton-Boxboro (3-0; Last Week: NR) Coming into the season, the Colonials received their fair share of hype. After a win over Barnstable on Saturday its clear that hype was deserved. 24. Whitman-Hanson (2-1; Last Week: 21) Hingham had too many weapons for the Panthers. Now, Whitman-Hanson will try to find some answers on offense ahead of its showdown with Duxbury. 25. Central Catholic (1-2; Last Week: 18) Central Catholic may be experiencing some growing pains early on offense, but its defense looks like it has the tools to pull off a postseason upset.